The Holy Apostle Matthias was born at Bethlehem, and was a descendent of the Tribe of Judah. 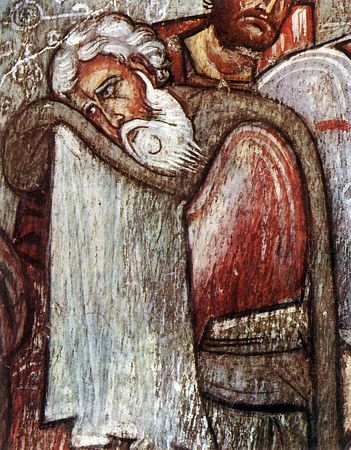 From his early childhood he studied the Law of God in accord with the Books of Scripture under the guidance of Saint Simeon the God-Receiver. When the Lord Jesus Christ revealed Himself to the world, Saint Matthias believed in Him as the Messiah, followed constantly after Him and was numbered amongst the Seventy Disciples, whom the Lord "did send by twos before His face" (Lk. 10: 1). After the Ascension of the Saviour, Saint Matthias was chosen by lot to replace amongst the 12 Apostles the fallen-away Judas Iscariot (Acts 1: 15-26). After the Descent of the Holy Spirit, the Apostle Matthias preached the Gospel at Jerusalem and in Judea together with the other Apostles (Acts 6: 2, 8: 14). From Jerusalem he went with the Apostles Peter and Andrew to Syrian Antioch, and was in the Cappadocian city of Tianum and Sinope. Here the Apostle Matthias was locked into prison, from which he was miraculously freed by the Apostle Andrew the First-Called. The Apostle Matthias journeyed after this to Amasia, a city on the shore of the sea. During a 3 year journey of the Apostle Andrew, Saint Matthias was with him at Edessa and Sebasteia. According to Church tradition, he was preaching at Pontine AEthiopia (presently Western Gruzia / Georgia) and Macedonia. He was frequently subjected to deadly peril, but the Lord preserved him alive to further preach the Gospel. One time pagans forced the apostle to drink a poison potion. The apostle drank it and not only did he himself remain unharmed, but he also healed other prisoners which had been blinded by the potion. When Saint Matthias left the prison, the pagans searched for him in vain – since he had become invisible to them. Another time, when the pagans had become enraged intending to kill the apostle, the earth opened up and engulfed them. The Apostle Matthias returned to Judea and did not cease with the enlightening of his countrymen with the light of Christ's teachings. He worked great miracles in the Name of the Lord Jesus and he converted a great many to faith in Christ. The Jewish High-Priest Ananias hated Christ and earlier had commanded the Apostle James, Brother of the Lord, to be flung down from the heights of the Temple, and now he ordered that the Apostle Matthias be arrested and brought for judgement before the Sanhedrin at Jerusalem. The impious Ananias uttered a speech in which he blasphemously slandered the Lord. By way of answer, the Apostle Matthias pointed out in the prophesies of the New Testament, that Jesus Christ – is the True God, the Messiah promised Israel by God, the Son of God, Consubstantial and Co-Eternal with God the Father. After these words the Apostle Matthias was sentenced to death by the Sanhedrin and stoned. When Saint Matthias was already dead, the Jews, to hide their malefaction, cut off his head as being an enemy of Caesar. (According to several historians, the Apostle Matthias was crucified on a cross, and indicate that he instead died at Colchis). The Apostle Matthias received the martyr's crown of death for Christ in about the year 63.